Tell SF Supervisors to Oppose Urban Shield! Pleasanton – Today, activists chained themselves to the entrances to the Alameda County Fairgrounds to protest Urban Shield, the highly controversial SWAT training and weapons expo hosted annually by the Alameda County Sheriff’s Department. 23 activists were arrested, cited, and released. Over 500 community members from many cities across California, including Oakland, San Francisco, Los Angeles, and Sacramento, joined the Stop Urban Shield Coalition in a massive mobilization, march and rally that included powerful speakers, art, and musical and cultural performances. 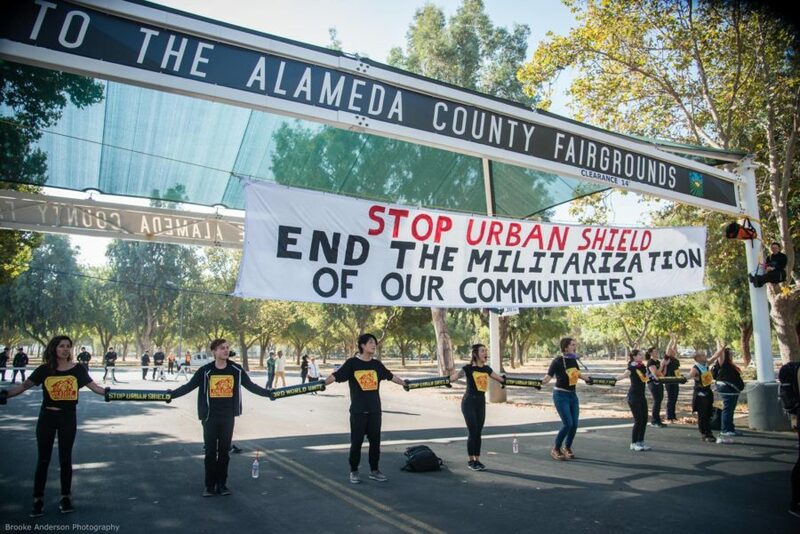 A broad coalition of grassroots community and social justice organizations, the Stop Urban Shield Coalition is amplifying the growing opposition to the militarization, policing, and violence in Black, Brown, and poor communities, and seeking to end Urban Shield. Urban Shield brings together police units from across the country for 48 consecutive hours of highly militarized scenarios, a program that activists condemn as promoting further violence and an increased war mentality by police in marginalized communities. It is funded by the Department of Homeland Security through a grant program called the Urban Areas Security Initiative (UASI), one of many controversial “War on Terror” efforts. Participants in Urban Shield also include armed forces from around the world, many of which have been accused of war crimes and human rights abuses. This year, Urban Shield lists law enforcement units from Mexico and Taiwan. Israel, which is widely condemned for its abuses against the Palestinian population, has also been featured prominently in past trainings. “When Urban Shield is bringing together repressive forces from all over the world to train with police here, we must stand together, work to end it, and fight policing and militarization here and everywhere.” said Nora Abedelal of the Arab Resource and Organizing Center. The Stop Urban Shield Coalition, along with one of its members the War Resisters League, has been collecting the stories of survivors of SWAT raids in order to uplift the voices of people impacted by the practices that Urban Shield promotes. “Across the country, we are seeing a growing normalization of militarized policing and SWAT deployment against people of color, particularly Black communities,” said Woods Ervin of Critical Resistance. “As a SWAT training program, Urban Shield is only expanding the violence that people face at the hands of police, and must be stopped immediately.” In the 1980s, there were roughly 3,000 SWAT raids a year; today, that number is up to 50,000. According to an ACLU report, Black people are up to 40 times more likely to be impacted by SWAT raids than white people. The coalition will continue to organize to amplify widespread opposition to Urban Shield, and militarization of police more broadly. They are planning a large town hall event in Oakland in the coming weeks focused on alternatives to Urban Shield. Rally to Stop Urban Shield Sept 9! We Defended Our Victory Against Urban Shield! Feb 26: Urban Shield is Gone – Let’s Keep it that Way!